At Officeworks we firmly believe that employers should be embracing a design approach that puts the wellbeing of office workers at its core. Here we explain the benefits of a biophilic design in the workplace and why a growing number of employers are bringing nature into the workplace. Biophilia is a concept first popularised by Edward O. Wilson in 1984, and describes the innate relationship between humans and nature. In a nutshell, biophilic design is the use of natural elements to enhance buildings. A global study into the impact of office design by Human Spaces found that working in offices with natural light, good ventilation and plants saw a 15% higher subjective wellbeing and a 6% productivity increase. 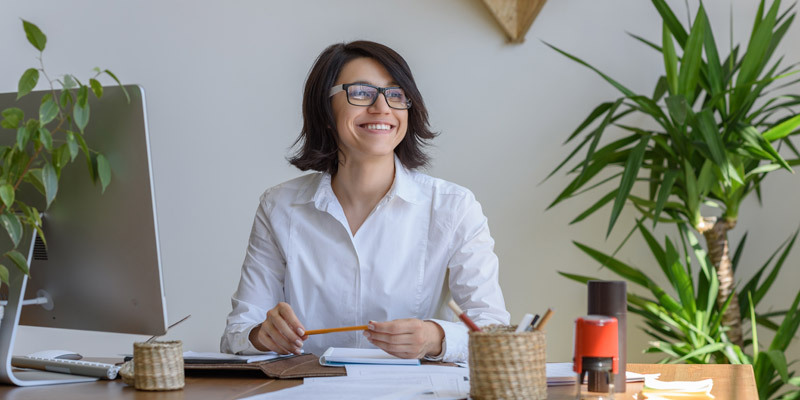 They also found staff were more likely to feel happy and inspired and less likely to feel bored or anxious when entering a biophilic workplace. Importantly, the report also found that office design was so important to workers that a third (33%) of respondents said that it would unequivocally affect their decision whether or not to work somewhere. Conversely, the same report also found that in European offices, 47% of employees have no natural light, 55% don’t have access to greenery and 7% have no windows. Biophilic design is more than a ‘nice to have’. The use of nature to harness employees full potential is becoming an essential aspect of modern, progressive office space. Businesses investing heavily in the approach include Apple with Campus 2 and Google’s Dublin Campus. Even if you’re just renting a small office within a commercial unit you can’t control, you can still employ some biophilic office design techniques. For example, you could add a potted plant on every desk, put up prints of nature photography on the walls and arrange the furniture in a way that creates partially enclosed private workstations in the corners and a collaborative ‘break-out’ area in the centre. When choosing an office to rent, consider the importance of windows.